Our J111 sails fitted perfectly and performed well from day one without any changes or alterations. With there continued commitment to J111 design development in 2014, we went on to win the first ever World Championships with a day to spare. 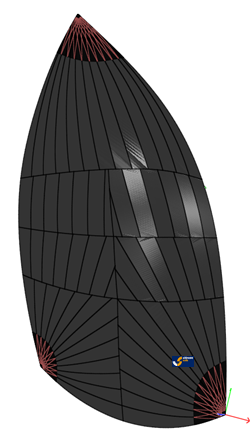 Class sails are constructed with primary Fibres of Carbon and Black Aramid which gives a good balance between shape retaining strength and performance. Durability is increased with the addition of a technora X ply scrim and extra leech fibre passes. The mainsail must be strong and versatile to be used in up to 35 knots without reefing. 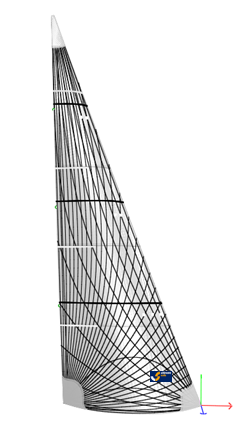 The relatively stiff carbon mast allows us to design a sail with less luff curve and more roach than most similar sized sails. The relatively big roach improves performance all round the course offering better speed downwind and helping to depower the sail and maintain rudder balance upwind. We've also recently introduced new fibre layouts to help support the aerodynamic shape of the sail over the full range of backstay tensions. When class racing the J111 Jibs are set on a furler which creates a potential performance sapping factor called the end plate effect. 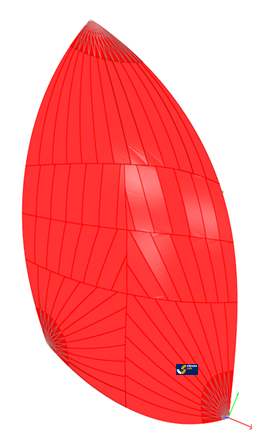 This is where the aerodynamic efficiency of a sail is reduced whenever there is a gap between the foot of the sail and the deck allowing air to escape underneath. 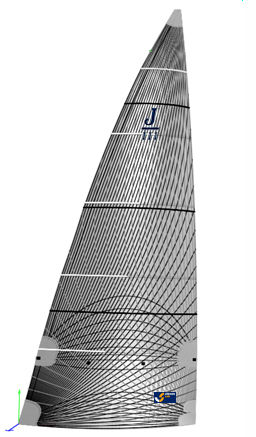 Most J111 headsails don’t have enough foot round and the result is a gap between the sail and the deck and a less efficient sail. Ultimate Sails J111 class Jibs are designed with enough foot round to force the air to travel up over the sail at all times and gives a resultant increase in performance. Scientific tests have shown that the aerodynamic efficiency of a sail is increased by between 5% and 7% when the gap between the foot of the sail and the deck is closed. You really see the difference when accelerating out of a tack, get into a tacking battle with anyone using our latest designs and there will only be one winner! The vertical profile of the Jibs has to be very fair to maximize the wind speed range in which they operate efficiently. We've refined this profile to ensure that each headsail generates maximum power at the bottom of its designed wind range but can then be flattened using a combination of sheet and halyard tension for maximum performance at the top end of the wind range. We’ve also introduced new Fibre layouts with increased fibre content (DPI) to help the sails hold their shape at the top of the wind range. Vertical battens support the leech of the class Code 3 ORC jib as they are the most reliable and cost effective solution for sails which are furled. 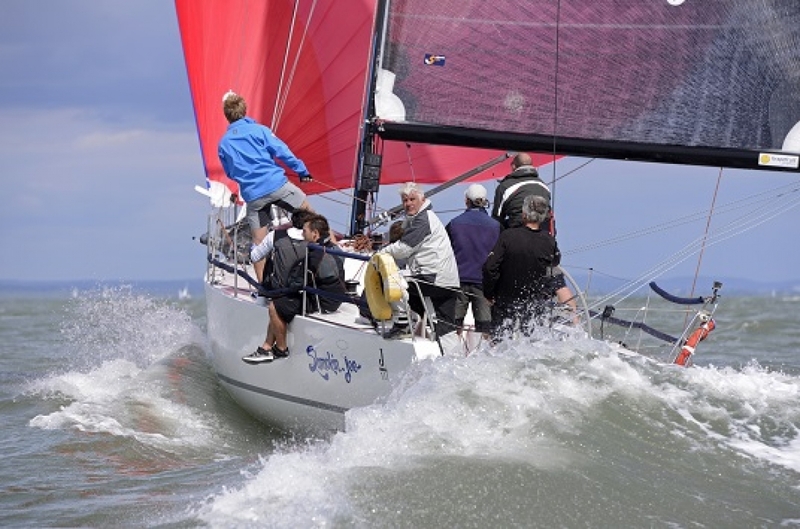 Ultimate Sails J111 Class Asymmetrics proved to be unbeatable in 2011 but we've introduced further refinements to help keep our customers at the front of the fleet in 2012. Class rules limit the J111 to two downwind sails so we've designed a Code 2 and Code 4 which will be effective through the full range of polars we developed for the boat last season. At times our customers were achieving speeds 50% faster than the designers polars (average downwind speed 18.51 kts!!) and they were able to do this due to the very stable luff which rolls well to windward and allows the helm to push the boat very hard downwind. This combined with stepped construction (0.9oz nylon in the high load luff area) and maximum twist in the top leech increases acceleration and helps to promote early planing for a great all round sail.